Symbols*: The turtle’s slow and methodical movements provide a great source of security and stability. But the turtle hesitates to jump into the water. It sees its reflection: a mirror into the past, free of the limitations posed by traveling on foot. The pathway to the water is treacherous. The roots are overgrown and pose obstacles for the reluctant turtle. It eyes a cup with desire but cannot reach it from the safety of the bank. A spiral on the tree is a reminder tha life is continuous. Adventure may await the turtle if it would just allow itself to leap into the energetic and vital element of the moving water where the cups are brimming with life. Description*: It is good to live a life founded on solid choices, yet it is important not to allow stability to develop into ennui. If we become too complacent in our current situations, we run the risk of becoming afraid of trying new things. Our relationships can grow stagnant due to the absence of stimulation, our creativity could wane for lack of input, and our sense of adventure and zest for life could languish under our self-imposed fear of change. 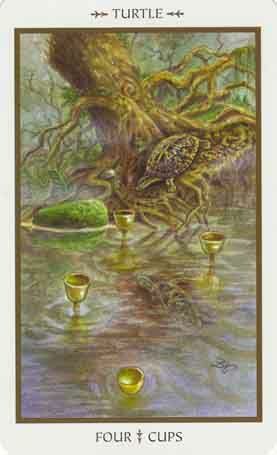 The turtle reminds us that in order to live fulfilling emotional lives, we need to connect with out inner spirits and explore the healing pools of our fertile imagination. Possible Meaning: I see this card being about making choices, you may be a bit afraid of it, you may doubt yourself or the choice to be made. Fear not, good things will come your way if you take chances. While this is a water card, the turtles are also earthly, in fact they are the oldest symbol of Earth. Use both water and earth energies to create harmonious flow in your life. Slow down the pace of your life; turtles are teachers of the art of grounding. Thoughts/Points to Ponder: Rather than seeing this as a negative card, I see this as a more positive card. Sure ther is hesitation towards taking the first step, sure there is even a bit of doubt and fear whether or not to take that step. If brave enough, one should take that step, who knows what it might bring. So take that step towards new chances, fear not but embrace new opportunities. Turtle is the oldest symbol for the Earth. It is the personification of goddess energy and the eternal Earth itself. If you have a Turtle totem, you must be mindful of returning to the Earth what she has given you. Honor the creative source within you. Use water and earth energies to create a harmonious flow in your life. Ask the Earth for assistance and her riches will pour forth. If a Turtle totem shows up in your life, slow down the pace of your life. Bigger, stronger, faster are not always the best ways to reach your goals. Turtle is fine teacher of the art of grounding. When you learn to ground yourself to Earth's power and strength, you place focus on your thoughts and actions and use the Earth's limitless energies rather than your own to accomplish your will.